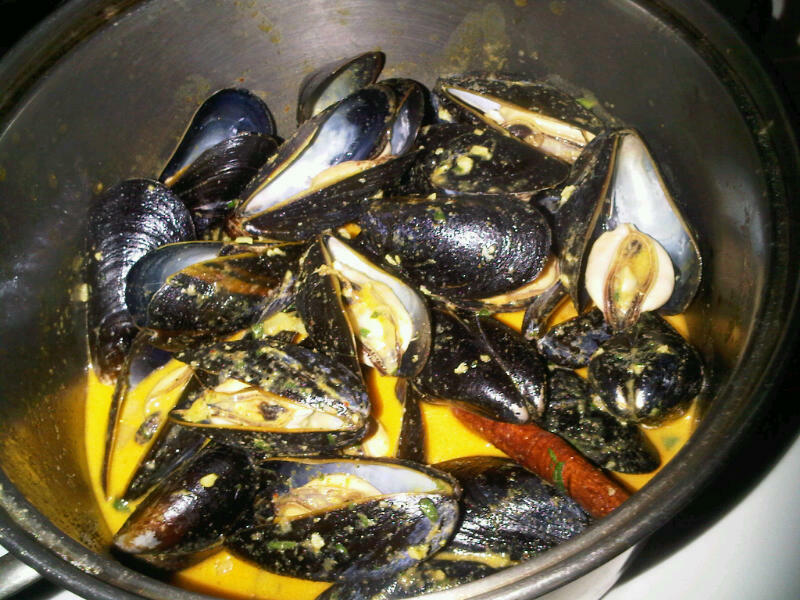 If there is one food that I crave above all others, it is mussels. They can be prepared in a variety of ways, encompassing a broad range of flavors; from coconut curry Thai to classic French white wine garlic. There are mornings that I literally wake up and have a hankering for a steaming pot of mussels. Not cheerios….mussels. Needless to say, if mussels are on the menu at a restaurant, I’m usually ordering them. And I have suffered dearly for this habitude, because lets face it, there are certain restaurants (i.e. Irish pubs) where you should NOT be ordering the shell fish. I know the bacon cheese burger is the safer bet, but I have no self-control and inevitably end up eating the mussels…..for better, for worse. 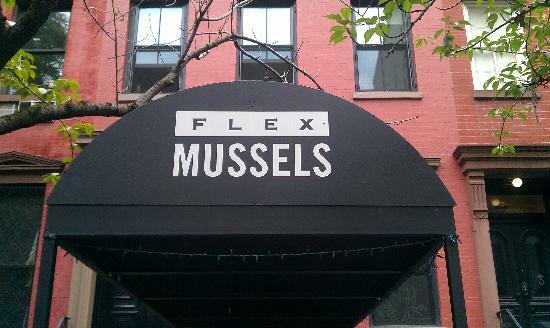 This weekend though, I had the opportunity to go to Flex Mussels, which is renowned in NYC for their fantastic pots of ornate and unique mussels…23 different types in all! You can imagine how difficult it was to choose only a couple to share with my friends and fellow diners, Sam & Sara. In fact, a third party observer would have thought this was one of the most difficult decisions of my life the way that I carefully weighed out each option, debating whether to go with the tried and true classics or branch out and go for the exotic. Finally, after a quick pep talk with our server, we arrived at a game plan. 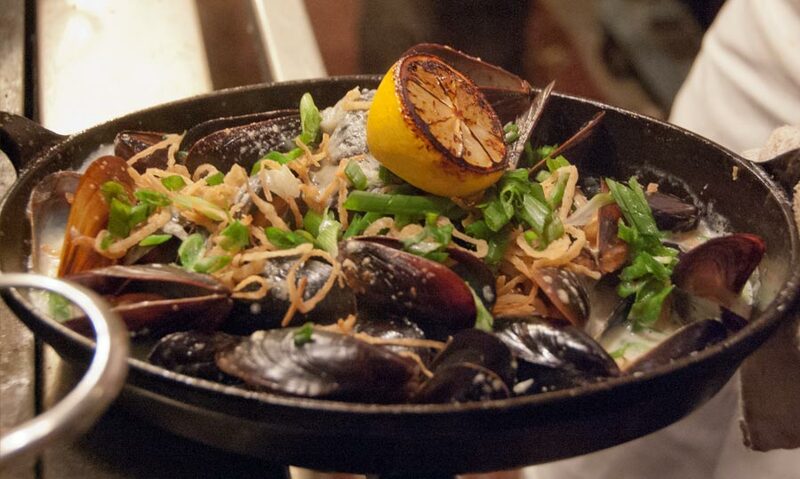 We would order three different pots of mussels to share among the table along with some truffle fries. 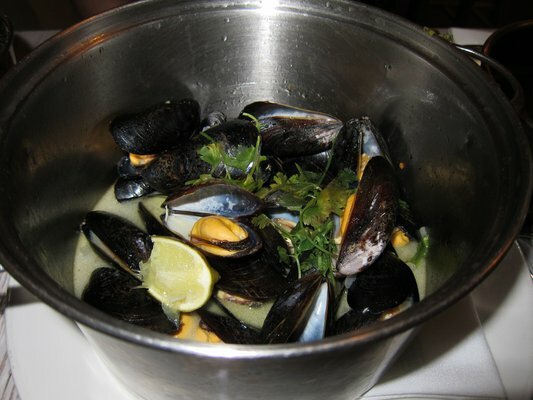 First we got an order of the Dijon Mussels made with dijon mustard, white wine, creme fraiche, and parsley ($19.50). These were by far my favorite of the three, and I made that known by locating the pot directly in front of me and my big fat fork. The broth was so good, I would consider it drinkable. The mustard brought forth a tangy and acidic flavor that was carefully balanced by the creaminess of the creme fraiche. And the chopped parsley was fresh and earthy. 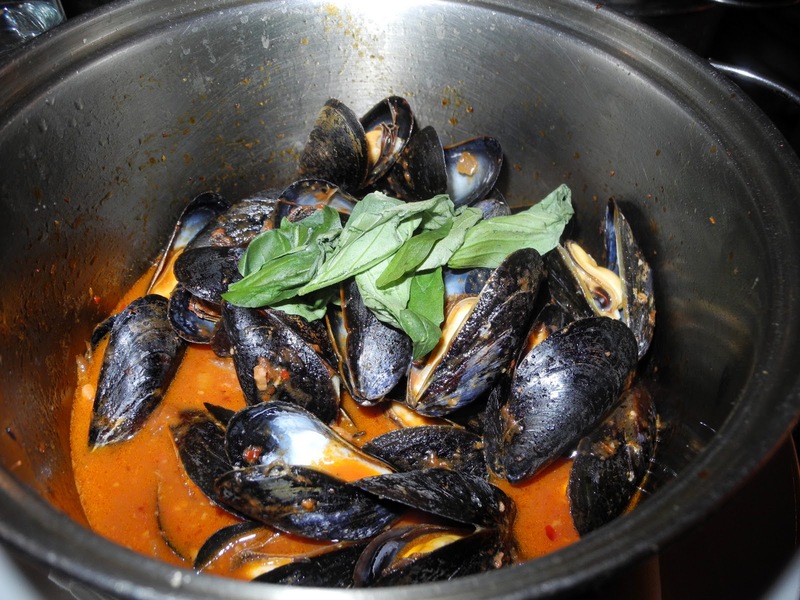 Next we enjoyed the Fra Diavolo mussels made with San Marzano tomatoes, olive oil, fresh basil, crushed red pepper flakes, and garlic ($19.50). Sam insisted that we order this classic, and although I thought they were good, I probably would not order them when at Flex again. Instead, I would opt for a more complex broth when at the Mecca of mussels, and save the run-of-the-mill spicy red sauce for the amateurs. I will admit that the large chunks of crushed tomatoes were delightful on the fresh baked bread provided for dipping and dunking! Lastly, we recieved our order of the South Pacific Mussels, which were made with kaffir lime, cilantro, white wine, and lemongrass. I tried persuading Sam and Sara to order the Thai mussels instead, which were very similar to the South Pacific in flavor, but with the added richness of curried coconut milk. Unfortunately though, it was two against one and we ended up going with the lighter broth. I wasn’t crazy about these because the broth was too almost too light. There was nothing sticking to the the meat of the mussel. I hoarded the remaining dijon mussels while my eating companions picked at their mistake. 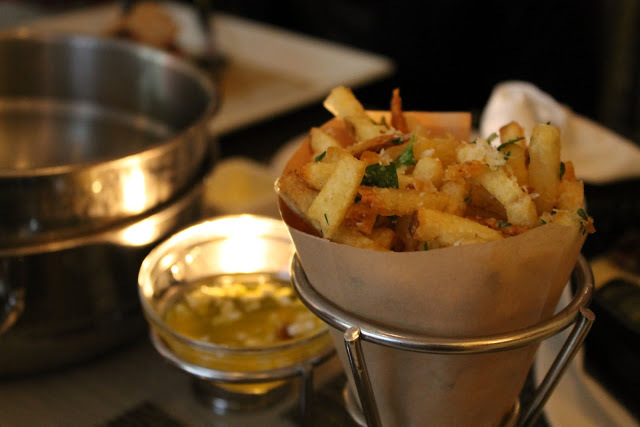 Last but not least, I must review the truffle french fries which were served with a creamy aioli dipping sauce. They were really delicious and made a perfect accompaniment to dip in the mussel broth (especially the dijon….did I mention it was drinkable?). Ohh and I almost forgot to mention the wine/cocktail selection, which is pretty reasonable for NY fine dining. My friends and I shared a bottle of the Vincent Dampt Chablis for only $54. The selection of wines was also fairly extensive, which is somewhat expected at a mussel-centric restaurant. I mean, what goes better with mussels than wine?! 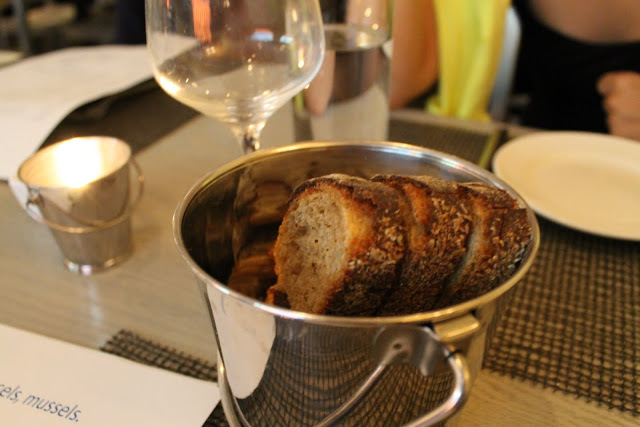 …..besides crusty bread, of course!